The ebay blurb said it was complete but not running and in that itty bitty photo it didn't look too bad. The seat was torn and all the alloy looked really dull, but the previous owner told me it had always lived in his garage, so how bad could it be? Right? 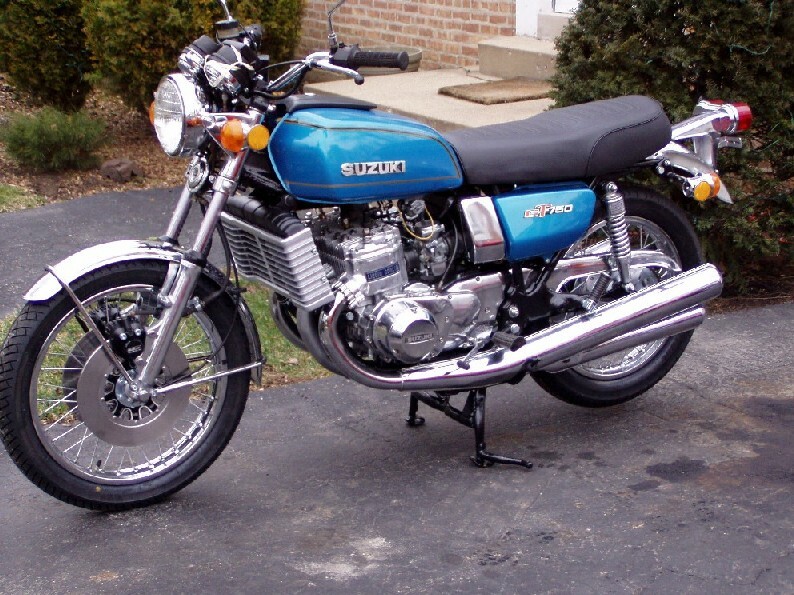 It had done 33,000 miles in the hands of the first and only owner who bought it new in 1976. 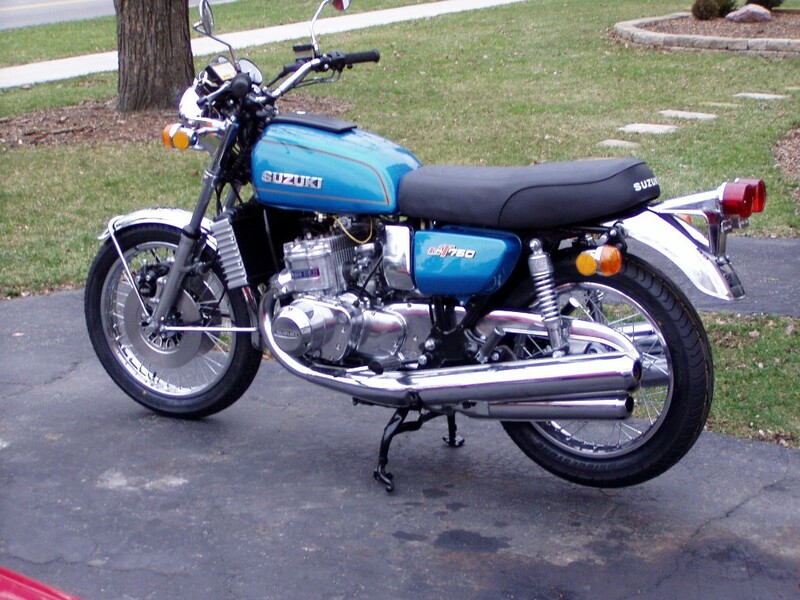 He rode all over the country on this bike until he started a family and then he stuck it away in his garage, where it has sat since 1986. 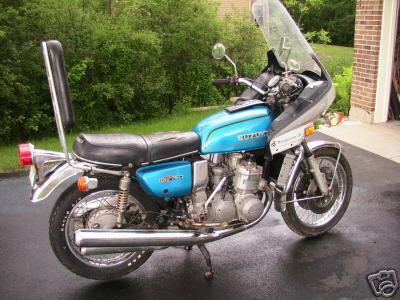 The first things to go were the Vetter Windjammer fairing and that cute, ever so 70's sissy bar. The motor was completely stripped and rebuilt with new seals and a rebuilt crankshaft. The pistons and barrel are OK, and all it needed was a light skim on the top and bottom barrel faces to bring it up to scratch. 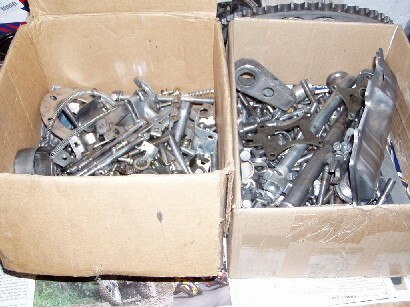 Alloy parts were either polished or painted to original specifications. 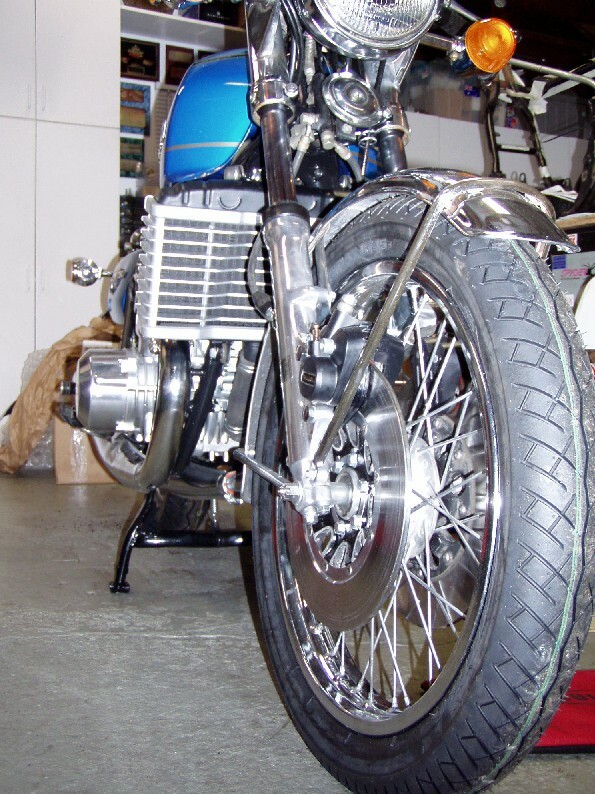 The carburetors were completely stripped, cleaned and rebuilt with new jets. Needles were inspected and showed no sign of wear so they were re-fitted. As they were assembled, they were adjusted and synchronized. 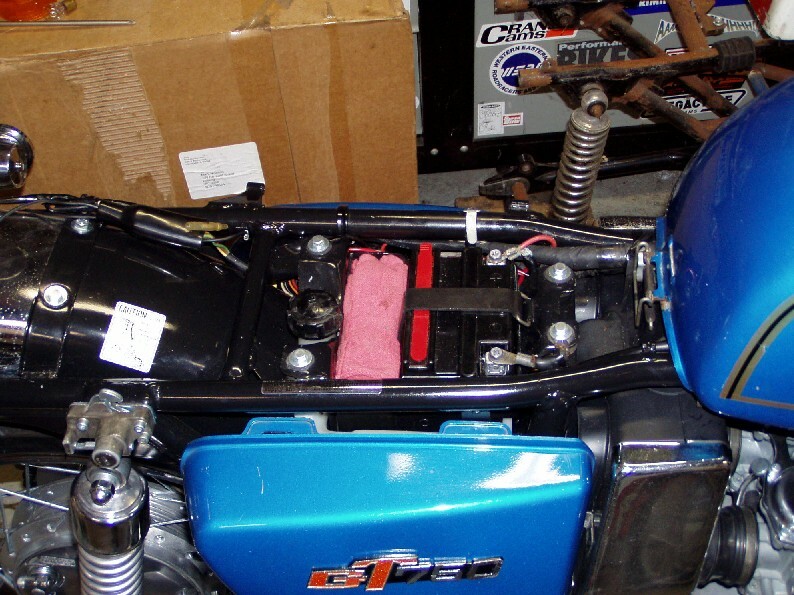 While the motor was out, the frame was stripped and repainted in gloss black. Swingarm bushes were not so good, and they were replaced and upgraded to bronze bushes, which were reamed to size and fitted with new bearing sleeves. 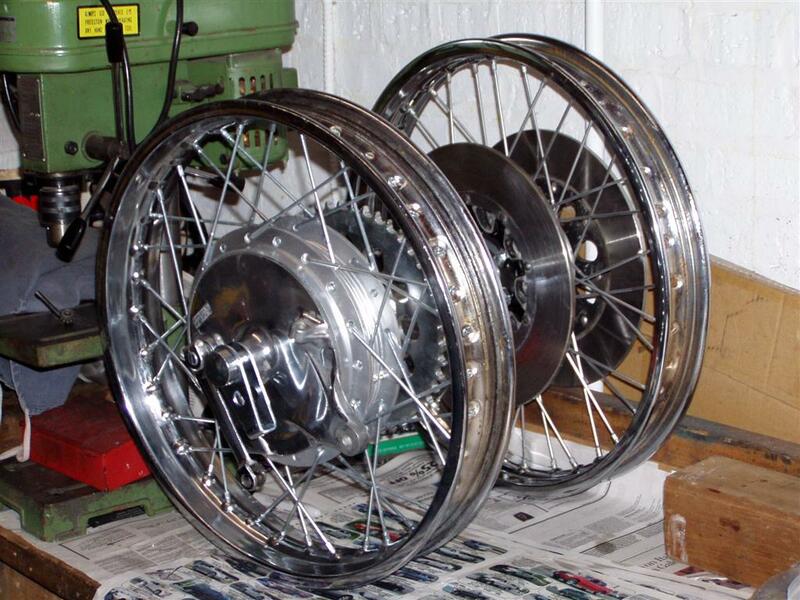 The front forks were stripped, cleaned and polished and assembled with new oil seals. All the chassis and external motor hardware was re-plated in bight zinc plate and heat-treated. Just to increase the difficulty, I had almost a second complete set of GT750 parts and a few TZ250 parts and few other odd bits in the same plating lots. They say that it's good mental exercise. 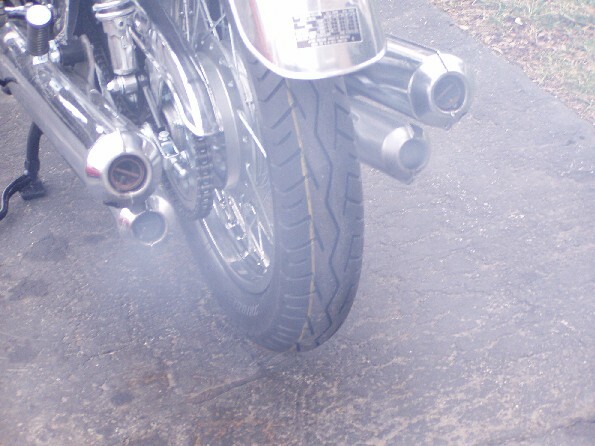 Wheels were rebuilt and fitted with new Bridgestone BT45 tires and tubes, which are the best tires available for a GT750. Brakes were completely overhauled and fitted with new Brembo brake pads at the front and new brake shoes at the rear. That's what the seat looks now after it was professionally recovered. 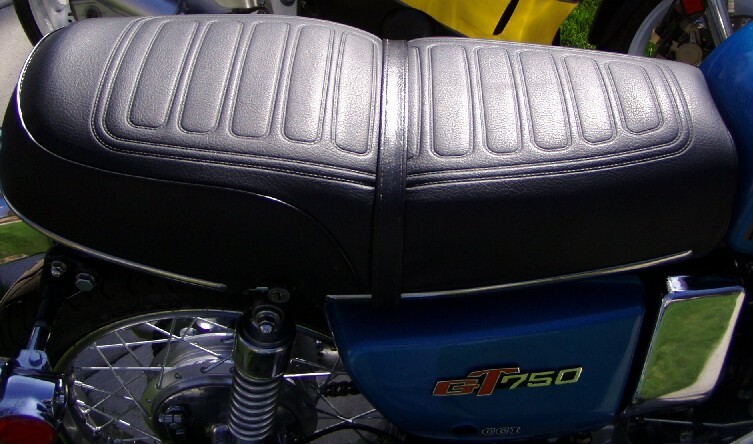 The seat cover came from the UK and teh pattern is an exact replica of the OEM part. A new chain and front sprocket were also fitted The rear one was new but had to be plated to brighten it up.